The tablet class is a smart technological teaching aid which is a great leap from the chalk and talk way of teaching. It helps the students to learn better, faster and retain the information efficiently. It has transformed classroom teaching into a stimulating experience where lessons come alive and contributes to sharpen and enhance the psychological aspect of a student’s sensory system. This visual aid caters to the learners’ thirst for information pertinent to their cognitive ability as knowledge procured through firsthand experience is far more effective than theoretical knowledge. The teachers too are benefited by this as they can enhance their knowledge in subject matter and also make their classes more interactive. 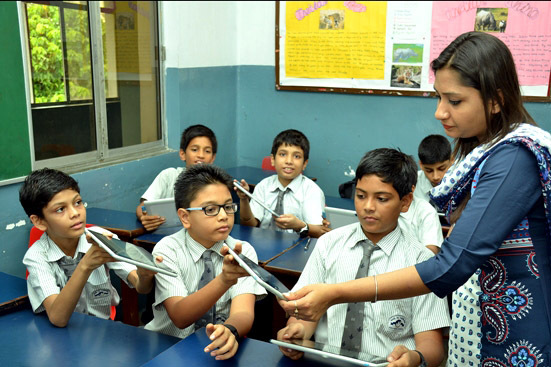 Birla High School for Boys has taken up the initiative to start off with the tablet classes in class VII in three subjects namely Biology, Chemistry and Geography and this is proving to be quite beneficial to the students and the teachers. The school looks forward to more excitement in teaching.